Perched on the elbow of Cape Cod in Orleans amid five acres of gardens and shade trees the non-smoking The Governor Prence Inn welcomes its guests with free Wi-Fi complimentary breakfast and a central courtyard with an outdoor pool. The single-story inn features exterior corridors and 56 rooms. All rooms come equipped with free Wi-Fi mini-fridges satellite TV and air-conditioning. The inn serves complimentary continental breakfast and features barbeque facilities and picnic areas. 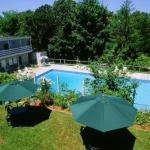 Guests frequent the motel's central courtyard and outdoor seasonal pool. Parking is free. The Governor Prence Inn is located on five acres in historic Orleans within walking distance of Orleans Cove restaurants shops and galleries. Guests can easily access the adjacent Rail Trail and take a 10-minute drive to Nauset Beach and the south side of the Cape Cod National Seashore. Nickerson State Park is five miles from the inn. Logan International Airport is 91 miles away.